Many massage therapists experience work-related skeletal muscle disorders (WMSDs). This study aimed to determine the proportion of the incidence of WMSDs and the relationship with the incident of posture WMSDs in massage therapists. The type of research was quantitative analytic observational with cross sectional design. The type of massage under study was traditional massage. Population and sample were massage therapist in Pekanbaru City 2017 with sample size 77 people taken by consecutive sampling technique. Data collection and processing used interviews with quesonnaires, documentation and Rapid Upper Limb Assesment (RULA). Level of risk of WMSDs incident used semi-qualitave analysis and nordic body map. WMSDs incidence rate in massage therapist was high enough that was 61%. The results showed that the variables significantly correlated with incidence of WMSDs were odd posture (POR: 8,30, 95% CI: 2,401-8,753), length of work (POR: 10,109; 95% CI:2,567-39,811) and age (POR: 7,649 95% CI: 2,567-39,811). The most WMSDs complaints on both hands were 57 people (74%), left shoulder and right shoulder were 27 people (35.1%) and lower back were 19 (24,7%). It is advisable in massage therapists to avoid awkward posture while massaging clients by improving work posture, posion while massaging and placing the equipment used within the reach of the hand. Albert, W. J., Currie-Jackson, N. dan Duncan, C. A. (2008) “A survey of musculoskeletal injuries amongst Canadian massage therapists,” Journal of Bodywork and Movement Therapies, 12(1), hal. 86–93. doi: 10.1016/j.jbmt.2007.03.003. Ariyani, E. (2016) Hubungan Penanganan Beban Manual dengan Keluhan Nyeri Punggung Bawah Pada Karyawan PT Perdangangan dan Perindustrian Bangkinang di Pekanbaru Tahun 2016. Pekanbaru. Ariyani, Y. M. H. F. (2017) Materi Ajar Pijat Urut Tradisional Indonesia Relaksasi dan Kebugaran. Cetakan 1. Bekasi: Kemendikbud RI, Kemkes RI, P-AP3I. Chuang, X. L., Ooi, C. C., Chin, S. T., Png, M. A., Wong, S. K., Tay, S. C. dan Mcgrouther, D. A. (2017) “What triggers in trigger finger ? The flexor tendons at the flexor digitorum superficialis bifurcation,” British Journal of Plastic Surgery. Elsevier Ltd, hal. 1–9. doi: 10.1016/j.bjps.2017.05.037. Fortune, L. D. dan Hymel, G. M. (2015) “Creating integrative work: A qualitative study of how massage therapists work with existing clients,” Journal of Bodywork and Movement Therapies. Elsevier Ltd, 19(1), hal. 25–34. doi: 10.1016/j.jbmt.2014.01.005. Grace, S., Crowley-mchattan, Z., Hons, B. E., Hardy, D. dan Mcleod, A. (2014) “ScienceDirect The effect of chronic shoulder pain on maximal force of shoulder abduction Franc.” doi: 10.1016/j.jbmt.2014.08.005. Mohan, R., Wong, V. W., Higgins, J. P. dan Katz, R. D. (2016) “Proximalization of the Vascularized Toe Joint in Finger Proximal Interphalangeal Joint Reconstruction : A Technique to Derive Optimal Flexion From a Joint With Expected Limited Motion,” Journal of Hand Surgery. Elsevier Inc, hal. 1–8. doi: 10.1016/j.jhsa.2016.11.023. Rodriguez, A. C. dan Barrero, L. H. (2017) “Job rotation : Effects on muscular activity variability,” Applied Ergonomics. Elsevier Ltd, 60, hal. 83–92. doi: 10.1016/j.apergo.2016.11.005. 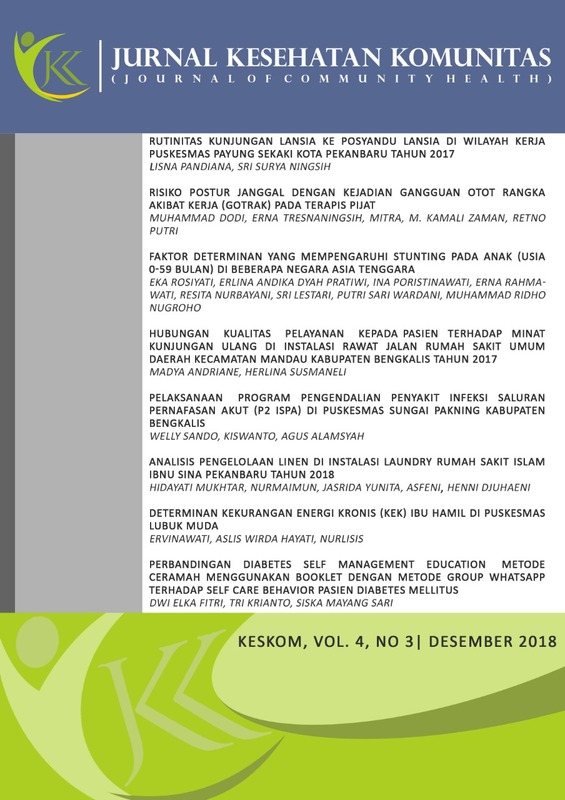 Sang, A., Djajakusli, R., Russeng, S. S., Masyarakat, F. K., Kerja, P. dan Sawit, P. K. (2013) “Hubungan Risiko Postur Kerja Dengan Keluhan Musculoskeletal Disorders ( MSDs ) Pada Pemanen Kelapa Sawit di PT . Sinergi Pekebunan Nusantara,” hal. 1–14. Tresnaningsih, E (2016) Ergonomi Dasar. Pekanbaru: STIKes Hang Tuah.